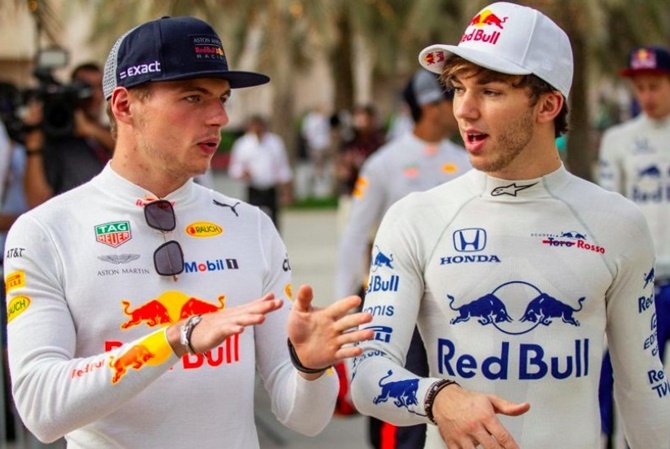 Former champions Red Bull, who finished third overall behind champions Mercedes and Ferrari last year, have switched from Renault power units to Honda for the season starting in Australia on March 17. Red Bull announced the Feb. 13 date on the team's Twitter feed, without details. Mercedes have already said they will run their W10 car for the first time in a private shakedown session that day. Racing Point, the team formerly known as Force India before being taken over by a Canadian consortium led by the billionaire father of racing driver Lance Stroll, will also present their new team branding in Toronto on Feb 13. Formula One starts pre-season testing at Barcelona's Circuit de Catalunya on Feb. 18, which will be the first chance to see the new cars together on track. The team launches kick off this week, with U.S.-owned Haas first out with their new livery in London on Thursday before Toro Rosso on Feb. 11. Fourth-placed Renault show off their new car at their Enstone factory in central England on Feb. 12, with McLaren removing the covers at Woking on Feb. 14. Ferrari have an online reveal on Feb. 15. Thirteen-year old Woman International Master Divya Deshmukh logged eight points to emerge as champion after the 10th and final round of the Velammal-AICF Women International Grandmaster Round Robin Chess tournament 2019 in Chennai. The second place was shared by Osmak Iulija (Ukraine) and Chennai girl P Michelle Catherina with 7.5 points. While the winner took home prize money of Rs 1.5 lakh, Osmak and Michelle Catherina were richer by Rs 1.25 lakhs and Rs one lakh respectively. In the final round, overnight leader Michelle Catherina went down to Osmak Iulija, which allowed Divya Deshmukh, a winner over Chandreyee Hajra, to leapfrog her to the top spot. The tournament saw Divya Deshmukh achieving an International Master Norm and a Woman Grandmaster Norm, while Michelle Catherina secured her maiden Woman Grandmaster Norm. R Anantharam, Chairman Arbiter's Commission, AICF, presided over the valedictory function and gave away the prizes. International Master Manuel Aaron, FIDE vice-president D V Sundar and TNSCA general secretary Stephen Balasamy were present. Results: Round 11 (Indians unless specified): P Michelle Catherina (7.5) lost to Osmak Iulija (Ukr) 7.5, Divya Deshmukh (8.0) beat Chandreyee Hajra (2.0), Saloni Sapale (4.5) drew with Aakanksha Hagawane (6.5). Munguntuul Batkhuyag (Mongolia) 7 beat Olga Babiy (Ukr) 6, V Varshini (3) lost to Uuriintuya Uurtsaikh (Mongolia) 5.5, Franco Valencia Angela (Col) 3.5 drew with Nakhbayeva Guliskhan (Kaz) 5. Final placings: 1. Divya Deshmukh 8, 2-3. Osmak Iulija (Ukraine), Michelle Catherina 7.5, 4. Munguntuul Batkhuyag 7, 5. Aakanksha Hagawane 6.5, 6. Olga Babiy (Ukraine) 6, 7. Uuriintuya Uurtsaikh (Mongolia) 5. 5, 8 Nakhbayeva Guliskhan (Kazakhstan) 5, 9. Saloni Sapale 4. 5, 10. Franco Valencia Angela (Colombia) 3.5, 11. V Varshini 3, 12. Chandreyee Hajra 2. Three Indians, N Vijay Sundar Prashanth, Arjun Khade and Sumit Nagal advanced to the second round of men's singles main draw of the Chennai Open ATP Challenger 80 tennis tournament. Wild card entrant and local player Vijay Sundar Prashanth stole the show with a 6-2, 2-6, 6-2 win over Carlos Boluda-Purkiss of Spain in three sets. He started in flamboyant fashion, stroking smoothly on both flanks and served with precision, breaking his rival twice in the first set to run out an easy winner. In the second set, the Spaniard improved his first serve percentage and held his serve despite facing six break points. The Indian appeared to lose concentration and lost two of his service games to let Boluda-Purkiss take the set 6-2. In the decider, Prashanth found his form and took advantage of his opponent's short returns by moving forward and putting away crisp volleys. From 2-all he took the next four games to seal a second round berth against compatriot and 11th-seed Saket Myneni. In other matches, an improved Khade breezed past Ivan Nedelko of Russia 6-4 6-1, while Nagal made short work of David Perez Sanz of Spain in straight sets. Nagal will take on eighth seed Duckhee Lee of Korea in the next round. Indian wild card entrant Abhinav Sanjeev crashed out in the opening round, losing 3-6 4-6 to Japan's Renta Tokuda. Frenchman Antoine Escoffier was an impressive 6-2 6-2 winner against Evgenii Tiurnev of Russia. The quaifying draw saw both the Indians -- Dhakshineshwar Suresh and Sidharth Rawat crashing out. PIX: Virushka giving us major couple goals yet again! Can India break All-England title jinx this year?